It’s still snowing, but let’s talk about grilled foods anyway. There is a bistro in town that makes one of my very favorite salads. It’s one of those meals that I find myself craving every now and again, so much so that I now make it at home quite a bit when oranges are in season like they are right now. Although its fancy champagne name may suggest otherwise, it’s a fairly simple salad, and a healthy one to boot! You can make this as a simple, wholesome weekday meal or as a wonderful indoor date night supper for you and your love. 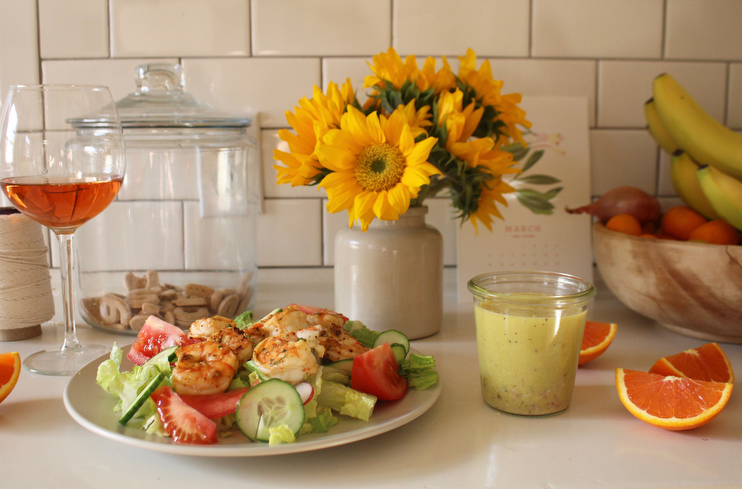 This dressing also pairs well with other grilled seafood and chicken. And if you don’t have a grill, a cast iron grill pan will do the job. That’s what I used! 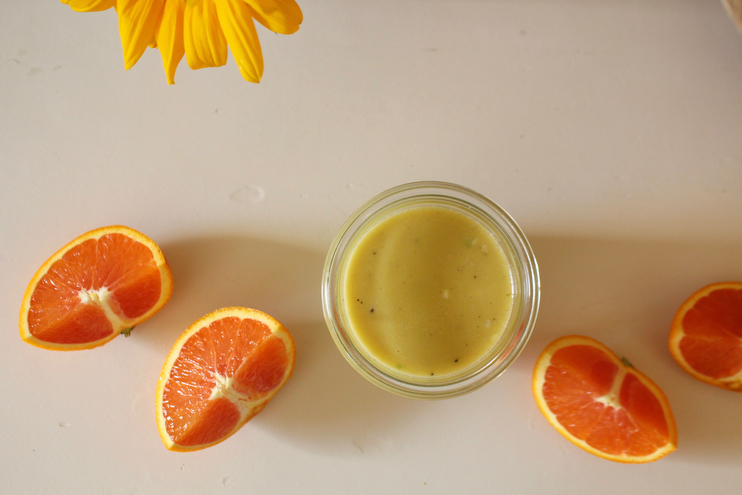 Juice of one orange – I love using Cara Cara Oranges when they are sin season because they are deliciously sweet and sort of remind me of a blend of grapefruit & Meyer lemon. To prepare, blend or whisk all vinaigrette ingredients together, adding the oil component last in a steady stream so the dressing emulsifies and does not separate. This recipe makes a little over one cup and you can store it in the refrigerator for up to a week. For a vegan dressing, you can leave out the mayonnaise or use Veganaise instead, it’s a staple in our kitchen. Goat cheese – if you’ve got it on hand! 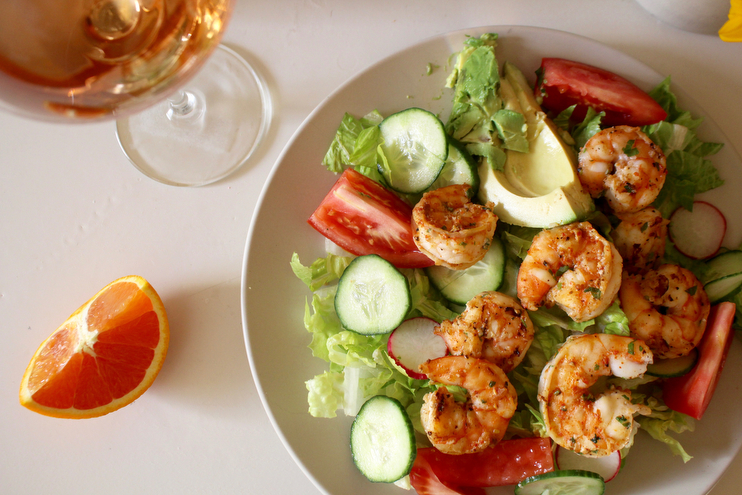 Arrange your salad as you like and top with the orange champagne vinaigrette. Serve alongside warmed bread and a glass of chilled wine and you’re set! Hi Amanda! I’ve been trying to figure out the best way to store recipes, as well as family rituals and memory-making ideas, into some kind of go-to seasonal book, that I can add to continually. It’d be a keepsake of sorts, a family how-to for us. Like there would be an entry for May Day, detailing recipes we use for that celebration, crafting instructions for flower crowns, etc. I’m just confused about the format I would use… do you do this, or is a digital format easier for your thought collecting? Your blog is an ultimate resource, of course!